Tiit-Rein Viitso, professor emeritus at the University of Tartu, is an Estonian linguist whose interests are among the most diverse through the ages. In his long academic career he has shown an interest in Estonian along with its closer and more distant relatives, as well as many others, all the way to Native American languages. Viitso has been inspired to study deeply and find new solutions using questions of linguistic theory from sounds to meanings, and also using the history of respective peoples, as well as that which is beyond language, be it rare natural or cultural phenomena. Looking at the thematics of his work, it is notable that there are some research questions that already intrigued him at the beginning of his career in the 1960s, questions that have remained at the centre of his interests for decades. Paramount among these is without a doubt the history of the Finnic languages, especially those spoken on the coasts of the Gulfs of Finland and Riga. Over time, his work on the languages of Curonia, Livonia and Virumaa have become more and more thorough and more widely meaningful. Out of Tiit-Rein Viitso’s more than 300 research papers, his later interests were visible in his diploma thesis from 1961, Maritime Vocabulary in Votic. Recently published and so far the fullest Livonian-Estonian-Latvian dictionary (Viitso, Ernštreits 2012) this text shows how thorough Viitso has been in preserving the Finnic coastal folk’s surroundings and their most important source of subsistence – fishing. His distribution charts and entries in the Finnic linguistic atlas (ALFE I–III, 2004–2010) are the best example of multifaceted research on the traditional life of the Finnic peoples. Viitso’s first article, “The phonology of the Luutsa-Liivtšülä sub-dialect of Votic”, was published in 1961. The phonetic systems of the Finnic languages subsequently became his most longstanding field of research. Already in 1966 he defended his candidate thesis on the Northern Veps, in which he applied a glossematic approach (see Viitso 1968), and in 1983 he became doctor of philology with his research on the phonology of the Finnic languages. The first version of this comparative work was published in 1981; this detailed analysis, comparing Estonian, Livonian, Votic and Vepsian sound systems, has been included in updated form in Viitso’s magnum opus, Livonian language and Finnic linguistic landscapes (2008). While studying the Finnic languages, Tiit-Rein Viitso has been an avid fieldworker. During dozens of summers from the 1970s onwards he has gathered priceless material from the last native speakers of Livonian, about 50 informants. This extensive data became the core of the large Livonian dictionary published in 2012. Tiit-Rein Viitso’s long-standing relations with Livonians and his work as the chairman of the international Livonian Friends’ Society shows the significance and responsibility that a researcher may have for a small people. In addition to research, Viitso has worked on advancing the Livonian literary language and editing books in Livonian, as well as teaching Livonian to the descendants of Livonians themselves. 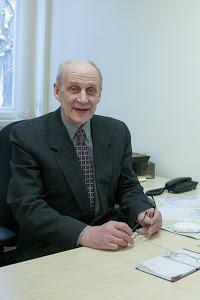 For this multifaceted work he was named honorary doctor of the University of Latvia in 2006. Equally long has been Viitso’s work as the chief editor of Linguistica Uralica, demanding a great deal of care and patience as well as supporting active communication with colleagues from many countries. Apart from Finnic languages, Tiit-Rein Viitso has published papers on several other Uralic languages, for example, Nenets (1970), Khanty (1979), and Saami (1985). He has been interested in the origin of languages and the relationships between Uralic, Indo-European and other language families of the Old World. However, Viitso’s dearest research topic has always been the early history of the Finnic languages. He has discussed Finnic land-taking and earlier contacts (1983), as well as reflections of the ancient amber road in modern languages (1994). Viitso has also proposed the most detailed description yet of the historical development of Estonian (2003, 2007). Viitso study of his native language, Estonian, has been especially versatile. He has discussed various aspects of the Estonian phonetic system and grammar, as well as the development of vocabulary. As the chairman of the Estonian Mother Tongue Society in the 1990s, he was responsible for maintaining the social functioning of Estonian. In 2011, Viitso received the Wiedemann Language Award for his long-term work in studying and developing the Estonian language, which is the highest possible approval the Republic of Estonia can give to a linguist. Tiit-Rein Viitso’s roots are in Virumaa, and the languages and dialects of Virumaa have also been subject of his research (for example, Viitso 1996). The language of his home coasts links his work with history and other peoples. In the last volume of the Finnic linguistic atlas (ALFE III, 2010) Tiit-Rein Viitso has compiled a distribution map and article of the word family jata; jada meaning ‘sequence; drift net’ (pp. 227–229). In Virumaa, as elsewhere in northern Estonia, a drift net was called rivi or ribi. The more common Finnic word jata ~ jada is also recorded, and in Vaivara also räitti, cf. Votic, Ingrian, Finnish raitti, which Viitso considers to be an old Scandinavian loan. The concept itself is old without a doubt. Using just one net seldom resulted in enough fish – a good catch was ensured by a sequence of several nets. That studying languages is in many ways comparable with fishing is apparent from Tiit-Rein Viitso’s life’s work: one must know where to catch, and the sequence must be long enough. It is possible to congratulate professor emeritus Tiit-Rein Viitso at the gathering in the evening. He asks that you not bring presents or flowers, and instead support publishing books in Livonian (Liivi Sõprade Selts (Jakobi 2, 51014, Tartu, Estonia), account number: 221053955884 (IBAN: EE072200221053955884), Swedbank AS (Liivalaia 8, 15040, Tallinn, Estonia), SWIFT/BIC: HABAEE2X).